The Telegraph had the chance to speak to Kingdom Hearts series director Tetsuya Nomura during E3 2018 about Kingdom Hearts 3, touching briefly on Nomura's feelings on catering to new and old fans, the unique relationship Disney and Square Enix have with each other, the possibiity of having Oswald the Lucky Rabbit in Kingdom Hearts, and Nomura's vision of making Kingdom Hearts feel similar to visiting a theme park. "I had to continue the story. But as a package, there is a definite start and a definite end. The core story is a continuation of past titles but there is one storyline for Kingdom Hearts 3. New fans may have a hard time understanding all of it. As we have so many titles now, including the spin-offs, it would be too much to even try and summarise what the story is all about." Considering just how long Kingdom Hearts has been running, there is always a question of just how much leeway Disney gives Nomura and his team when it comes to their properties and characters. "It's not that we could freely do what we want, we always confirm with Disney and get approval for them for everything that we do. But I’ve always had a hunch on what I can’t do with Disney properties since we started the game. So it wasn’t too difficult to get things right under their guidelines. Now I’ve been working with Disney for a long time I know more of what I can and can’t do. The guidelines have changed over the years, so there are things we can’t do any more that we used to be able to in the past, but I do think that Disney trusts us a lot more now than they did before, so I’m very grateful for that." The relationship between Disney and Square Enix isn't directed by these guidelines that are in place, though. There is a much more open relationship between the two companies, especially when it comes to sharing information with Nomura's team. Due to the fact that Kingdom Hearts 3 is pulling from a lot of modern Disney and Pixar films, Nomura and the development team have been able to communicate with the teams at Disney in order share assets to study so they can bring those stories and characters to life in Kingdom Hearts 3. "We can’t use the data as is, we have to recreate it ourselves, but sometimes when we create something that’s really good and Disney thinks it’s really good, they will ask for our information in return." "No titles have actually been rejected so far. It’s not really a title or film but I did ask to see if Oswald was possible but the answer we received from Disney was that it would be difficult to do. I didn’t receive any details as to why." "This falls in line with the concept I had for Kingdom Hearts from the start. I wanted to create a game that is like a theme park. Where there is a lot of characters and a lot of games and fun. 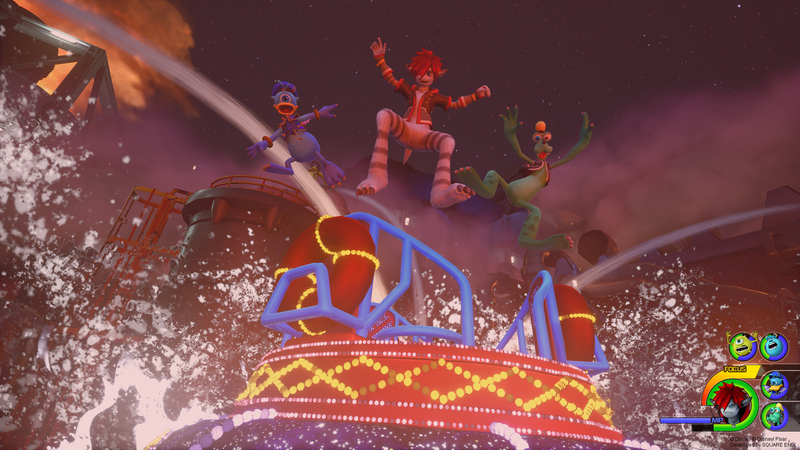 So when I was looking to create something new for Kingdom Hearts 3 I thought the rides would be a good motif." Read the full interview on The Telegraph (registration required). Thanks to forum user Zip for the tip! â€œI had to continue the story. But as a package, there is a definite start and a definite end. The core story is a continuation of past titles but there is one storyline for Kingdom Hearts 3.
ugh let's ignore Angry Joe. He's recalcitrant towards fans of things he just gives no shits about most days. Kingdom Hearts isn't the first time he's pulled this crap and it won't be the last. And he still keeps ignoring people who say jumping into KH3 is like jumping into Infinity Wars before watching at least some of the films and expecting to understand anything. Or jumping into Harry Potter at the last book. Or Game of Thrones in the 5th season. But "games are different". No, they are not. Interesting. I always assumed that Square Enix had more creative freedom with each Disney property they use in Kingdom Hearts, not less? I wonder what they can no longer do in Kingdom Hearts that they were able to get away with in the past? And I bet he will rag on KH3's story the same way just because he chose not to at least read some recaps of the story if he feels getting the collections was that big of a chore for him. I'm not saying KH3's story will be perfect but if he's going to(and I know he will) say that KH3 was lame or pretty meh because he couldn't understand the story or characters even though people have advised him to touch up on the characters and lore first, then he has no one but himself to blame. Sorry for kinda derailing the topic of the thread but the guy's attitude irks me. I wonder what made Epic Mickey so special they were willing to make it less difficult to use Oswald...its kinda disappointing. But as soon as I read the title I assumed he had said no otherwise that would ruin the surprise. Yeah that was weird to me too....I'm really not sure I know what he means tbh. Like I can't think of anything that crazy that happened in like KH1 that has never happened since in regards to Disney. Well, other than them being the main villains most of the game lol. So I'm assuming Oswald is a no show? Dang, he would of been super interesting to see. I think you are misunderstanding. Disney has always had an internal set of guidelines in place for how characters are portrayed, what can and cannot be shown in shows/films/games, what can and cannot be done in a storyline. This is something that everybody follows when it comes to developing stuff for Disney. I've only ever really heard staff of animated series really talk about it because it is more heavily enforced with the shows and tends to be a big source of issues with show development than with the WDAS film productions. Honestly, it is surprising Nomura mentioned it so easily here. Since nobody really blabs about their guidelines all that often, we probably won't ever know what has really changed. We could probably go through the games after KH3 and point out themes that are very clearly not present anymore, or actions that we just don't see happen in the series now vs in the past. So did Angry Joe go on a rant about KH3 recently? Also I'm curious why Disney thought adding Oswald would be too difficult. Maybe because Disney wanted to keep him obscure. From what Alex said in interviews and on Twitter, Disney stopped caring towards the end and kind of just let him do what he wanted with only a very small handful of restrictions. It wasn't like they could threaten to fire him when he was already leaving, and they couldn't threaten to not air the show because the fans would have been beyond angry about it. Thus why episodes surrounding Weirdmageddon and Weirdmageddon were chock full of all kinds of visual horror. I think Kingdom Hearts is only now just starting to earn more respect from more upper-level Disney executives now, but that respect doesn't necessarily translate into easing the set limitations. It could mean more creative freedom or more stringent rules on how things can be portrayed. It is honestly a tossup most days. There are likely some intricate legal issues that Disney isn't open to speaking about when it comes to Oswald, and some internal issues on what they want to do with Oswald. At the least, it is cool to know Oswald has been on Nomuraâ€™s radar. Maybe things will work out for his inclusion one day. New fans may have a hard time understanding all of it. As we have so many titles now, including the spin-offs, it would be too much to even try and summarise what the story is all about. He's all over the place. Didn't you just release those recap videos? We canâ€™t use the data as is, we have to recreate it ourselves, but sometimes when we create something thatâ€™s really good and Disney thinks itâ€™s really good, they will ask for our information in return. What does this mean? Is he referring to the recreation of scenes involving Disney characters? Which is weird because Oswald was regained back in 2006. I wonder if the character is tied down to licensing agreements with Junction Point studio (creators behind Epic Mickey). Unfortunately the studio closed down about 5 years ago. Oswald has featured in short films and Disney Infinity after the closure. I'm just curious to know Disney's explanation. Regarding retelling the lore and story of the series so far, I imagine Nomura is speaking in terms of recapping information in-game. There will not be any major efforts, outside of the natural unfolding of the story, to catch the player up to the story so far during the game. The recap videos are a great source outside of KHIII that fans can access to catch up on lore. WELL...technically the interview was done before the recap videos went up. I think he means like long, detailed summaries. Everything. All of the assets in KH3 were built from the ground up, and all of the animations were also created from the ground up. Of course, they had the references available to look at and study, but they couldn't import any of that data. Nomura is saying that Disney has been so impressed with just how well they were able to recreate these assets, they have started trading data between companies and information about the processes. Did these interviews all happen around the same time? Are they still being held now? I kind of wish Nomura would say less about the game until it's complete. Keep in mind that these interviews were likely all conducted during E3. The media outlets choose to wait a bit to publish their interviews so they donâ€™t get lost in the shuffle of all the other news coming out of E3. Therefore, these comments were made prior to the release of the recap videos. He probably hadnâ€™t announced them at the time of the interview which is why he didnâ€™t bring it up. Heâ€™s saying that Disney will sometimes want to use impressive Disney assets Square Enix creates. For example, if Princess Tiana is in the game, I wouldnâ€™t be surprised if Disney asked for information from her new KH model to use for her model in Wreck It Ralph 2. That might not be the case, but the concept at least is probably what Nomura means. These appear to all be done around the same time. He is going to spoil the entire game at this rate, lol. I can see why some fans went AWOL the moment the release date dropped. It does say there will be surprises saved for the game though! One interesting thing is Nomura doesnâ€™t seem to correct the interviewer when he mentions Riku Replica appearing. So maybe that is soft confirmation it is him? At this point it would probably make more sense for it to be Repliku instead of KH1 Riku. Also I like how he is determined to have the game come out in January. Makes me more hopeful there won't be a second delay. Iâ€™m surprised he has done this many! Considering he didnâ€™t do any for D23 Japan iirc, I thought maybe he wanted to stand back a bit and let trailers and the other developers do most of the talking. >Posso dirti perÃ² che molti dei personaggi che sono apparsi nei capitoli passati torneranno, e ce ne sono diversi che non abbiamo ancora mostrato. Abbiamo tenuto segreti anche alcuni personaggi molto importanti che lasceranno i fan a bocca aperta. Sono sicuro che molte persone rimarranno piÃ¹ sorprese dai trailer che mostreremo nei prossimi mesi rispetto a quelli che abbiamo mostrato finora. >Though I can tell you that a lot of the characters that have appeared in the past chapters will return,and there are a few we haven't shown yet.We've also kept secret a few really important characters that will leave the fans amazed (lit. A bocca aperta - with their mouths wide open - to be extremely suprised).I'm sure a lot of people will be more suprised by the trailers we're going to show in the next months than by the ones we've shown so far. Actually,I'm not even sure why I bothered TLing it since google translate works just fine,so it seems. Assuming almost all characters will return, itâ€™s going to be interesting how they reveal them in a way that delivers that much surprise. One of the few things I can think of that would leave me THAT surprised would be like if Eraqus is revived as his young self or something. Iâ€™d love for him to be a surprise Guardian, fighting for the lives of his future pupils. I'm highly considering doing this. But I really don't want to miss out if they release another special edition, or like that treasure box bundle Europe got. I'm gonna have to unsubscribe from a bunch of people on Twitter and YouTube. Anyone willing to email me or texting me? When something like that drops? I did it guys I unsubscribed from everything related to KH that's not from the official account. Following the square enix store now. I'll probably stick around here til utada drops her album. Wish i could go awol myself...but the need to know what worlds are left is just too strong! Not counting Big Hero 6, we've presumably got 2 to 3 Disney worlds left to reveal. We're at the (literal) deep end at this point. I'd rather not be surprised for the Disney worlds because I don't want to expect a Disney property that's not going to be in the game. True that's super nice of you! I'll make sure to message you my email so you can keep me updated.